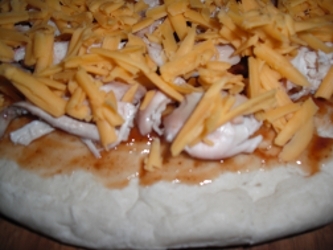 This BBQ chicken pizza recipe goes together quick with ingredients that can be prepared ahead. If you want to get your kids helping in the kitchen let them measure and spread the sauce, chicken and cheese. If they are old enough they can put it in the oven and cut it too. Serve with a salad to get some veggies in. If your using a par baked frozen pizza crust you do not have to thaw it. If your using raw dough for your crust crank up the oven heat to 500 F, preheat your pizza stone or pan or par bake the crust for 3 minutes before adding the toppings. Spread the sauce on the pizza crust from the middle out, leaving some space for the edge of the crust. I use about a half cup but you can use more or less to taste. BBQ sauce is way stronger than regular tomato pizza sauce so I recommend you go light, especially the first time around, if you want more add it to the next pizza. Evenly spread cooked chicken over the sauce. I use boiled chicken breast that I freeze in bulk or pieces pulled off a roasted chicken. No need to thaw cooked frozen chicken for this recipe. You can also slice and saute up a breast or two just for this dish if you don’t have any pre-cooked. Spread the cheese evenly over the top leaving room on the sides so it doesn’t melt off the crust. Bake at 400 for 15-20 minutes until the cheese is melted and bubbly if using a par baked crust. A fresh crust might take a little longer. Turn the oven light on to check the pizza, don’t keep opening the oven door. Cheeses: Gouda and Mozzeralla are often called for in BBQ chicken pizza recipes instead of cheddar. Sauces: Try your favorite BBQ sauce or a homemade variety. Toppings: Consider adding sliced red onions before baking and fresh chopped cilantro after baking. Crusts: Use your favorite homemade or store bought crust. If you want to make one from scratch but don’t have the time for a yeast crust to rise use my no yeast pizza dough recipe. If your preparing this recipe for the freezer make sure all the ingredients are cool, you don’t want the cheese to start melting and it will take longer to freeze if the ingredients are warm which could lead to a soggy crust. Once your sauce and toppings are on wrap the pizza in a layer of plastic wrap then cover in tin foil. Baked pizza can also be wrapped in plastic wrap and then in tin foil. If your freezing a pre-cooked pizza I would slice it first so it’s easier to reheat. Label, date and add to your freezer inventory sheet. Bake prepared pizza from frozen at 400 F for 15-20 minutes. Do not thaw. Reheat cooked pizza slices in the microwave a minute or two until warm or thaw in the fridge. Return from BBQ chicken pizza recipe to the homepage of Favorite Freezer Foods.